Installing floors is a great way to improve the effectiveness of any home staging efforts, since the entire décor is literally built from the ground up. Staging the floors in your home should be a universal goal for anyone who is selling their property on the competitive open market. To make the most of your flooring, sometimes repairs or replacement is required. Luckily, flooring installations are easier and cheaper than ever before and can even be an ideal DIY staging project for sellers with some basic home improvement skills. This article will help property sellers to learn about all their many options for installing new flooring as part of an overall home staging project. Carpet is simple and cheap to replace. When selling, it is rarely needed or advised to invest in high-end carpeting, since a cheaper alternative should do the job just fine. The only exception is in luxury homes, where quality counts for everything. In such a residence, never cut corners to save a few dollars, since buyers will not compromise on finding everything they desire in such an expensive home. Carpeting is not currently in vogue and carpeting should never be installed over wood floors which can be refinished or repaired. This is real estate sale suicide. My advice is typically to replace carpeting in most areas of the home with laminate flooring for an easy fix and refinish existing wood flooring to breathe new life into original home details. Wood flooring should only be installed by a professional or seasoned carpenter. This is not an easy project for most home owners, although with the right tools, and research, it is certainly not beyond the means of an experienced DIYer. Laminate flooring, on the other hand, is easy to install and does not require too much knowledge or too many tools. Most free-floating laminate floors have been specifically designed to be super-simple to install and a few even market themselves as being idiot-proof. Laminates certainly represent excellent value in cost and durability, as well as make the list of consistent buyer-pleasers for virtually any room in the home. However, once again, in luxury properties, never use laminates. 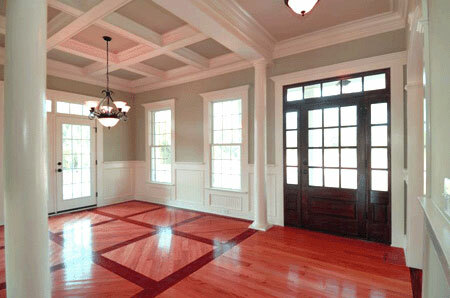 Instead, invest in quality wood, stone or tile flooring, even if the cost is considerable. Tile is super easy to put down, while slate and stone are a bit more of a challenge. Cutting these materials is really the toughest part, but if you have the tools, or can rent them, you are in business. Just be sure to lay down the materials first, and plan out the flow, before actually fixing any surfaces into place. Most home owners can learn to lay tile or slate in a matter of minutes. Repairs on these surfaces could not be easier and are ideal ways to get used to the techniques needed to do more extensive tile work. If you have limited experience, try replacing a few tiles in an existing surface first and then you will be ready to step-up to the big show and do a whole room. Tile costs range wildly, so shop around to get the best value. Buying quality closeouts or odd-lots can save you up to 80%, when compared to the typical stock tiles on display. Remember that you can save a large percentage of renovation costs if you purchase your own materials, instead of burdening your contractor with this detail. If you can install the floor on your own, your cost will be a mere fraction of the total price for professional installation. There are many resources to help DIYers with the skills and tips they need to get the job done right. I advise taking the time to research these resources and utilize them to achieve expert results, without professional costs. In the end, any skills gained will stay with you for life, making them far more valuable than just being used once to sell this home. If you become good at working on flooring, your new home, and every other property you might ever own, will all benefit from your new skill set.